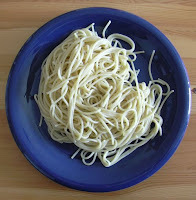 6th Floor Blog: Pasta Fight! Today's contributors are: Ann and Scott. Ann is washing dishes when the timer goes off. Scott looks at Ann elbow deep in soap suds and complies. He takes the wooden spoon and scoops out two strands of spaghetti and flings them at the ceiling, where they stick. “Pasta's done.” Scott says, pulling the inside part of the pasta pot out, and turning off the stove. “Did you have to throw it against the ceiling? Couldn't you have just tasted it?” Ann asked, drying her hands. It's still the best way to check if it's done. But I might have suggested the wall . . .
Dinner's more fun if you have to jump for it. And damn Ann..this blog is screwed up in Chrome. fix it!